Background: Malignant tumors are the leading cause of death in humans. Due to the tedious efforts and investigations made in the field of marine drug discovery, there is now a scientific bridge between marine and pharmaceutical sciences. However, currently only few marine drugs have been lined towards anticancer direction yet many more to are be established in future as well. Method: This review gives an overview of present status of marine natural products MNPs both at the level of research and clinical stages. The authors haved summarized the detail information of diverse marine organisms that were reportedto be active or potentially active in cancer treatment in the last two decades. 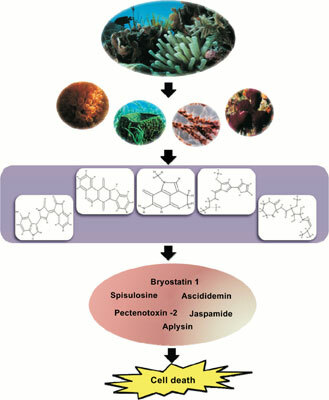 Interstingly, marine organisms are abundant producer of plenty of structurally incomparable bioactive metabolites that have unusual mode of actions and diverse biosynthetic pathways. Results: This review summarizes the associated anticancer properties of different classes of marine natural compounds based on their structural diversity, biological activity, and the molecular mechanisms of action. Emphasis has also be given to recent advances in clinical development of marine agents used in clinical trials. Conclusions: The present review is summarising the various sources of marine chemicals and their exploration of anticancerous potential. There is justified hope for the discovery and development of new anticancer agents from the marine environment. Keywords: Anticancer activity, apoptosis, marine chemicals, marine environment, marine organisms, therapeutic agents. Keywords:Anticancer activity, apoptosis, marine chemicals, marine environment, marine organisms, therapeutic agents. Abstract:Background: Malignant tumors are the leading cause of death in humans. Due to the tedious efforts and investigations made in the field of marine drug discovery, there is now a scientific bridge between marine and pharmaceutical sciences. However, currently only few marine drugs have been lined towards anticancer direction yet many more to are be established in future as well.